In the last years of the 19th century an interest in America's early history swept the country. Sparked first by the Centennial celebrations of 1876, it was furthered by New York's 1889 Centennial of the Constitution. 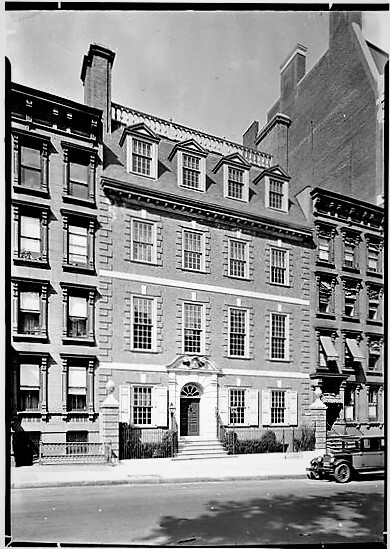 Colonial fervor was manifested in the 1890s and early 1900s in prim neo-Georgian and neo-Federal homes of Manhattan's wealthy, the restoration of historic properties like Fraunces Tavern, and pride in early American family roots. A number of social organizations and clubs were formed--like The Sons of the Revolution, The Daughters of the American Revolution, and the Society of Colonial Wars. In 1891 a similar society, the Colonial Dames of America was founded. To quality for membership, a candidate must have had an ancestor "who came to reside in an American Colony before 1776, and whose services were rendered during the Colonial Period." At the time of the society's founding the neighborhood around East 71st Street and Third Avenue was one of middle and upper-middle class brownstones. The building at No. 251 East 71st Street was described as a "four-story and basement single flat," meaning there was one apartment per floor. But by 1928, when the Colonial Dames laid plans for a new headquarters, the neighborhood had become fashionable. The 71st Street block between Second and Third Avenues had been made even more so when the Junior League chose it as the site of its new clubhouse. 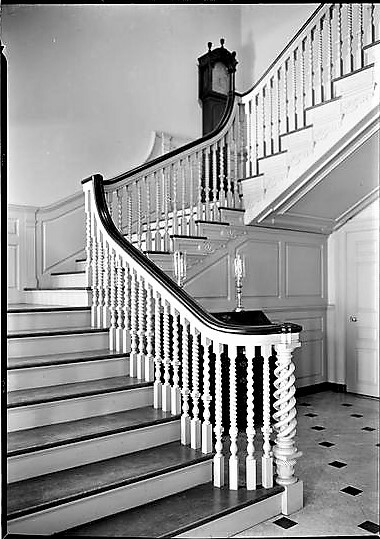 The Society of Colonial Dames in the State of New York purchased property on the same block and commissioned architect Richard Henry Dana, Jr. to design a structure that would reflect the organization's colonial ties. The result was a Georgian reproduction so perfect that only its date of construction demands the "neo" prefix to the style. The Society had, apparently, originally hoped for an authentic 18th century house. But as The New York Times explained on November 16, 1930 "Few examples of homes of Colonial days are left standing here and the society has undertaken to render what it considers a civic and patriotic service by reproducing such a house, filling it with objects of historical interest and opening it at stated times to the general public." The cornerstone was laid on November 15, 1930 during troubled times. Not only was the country overwhelmed by the Great Depression, but socialists and communists were demanding changes in government. In his comments Police Commissioner Grover Whalen noted that "there was never a time when true patriotism was more needed than today. "During the war there was plenty of it, but now patriotism is not being dwelt upon...There are those who want to reform everything, including our architecture of government." The headquarters building was completed the following year. 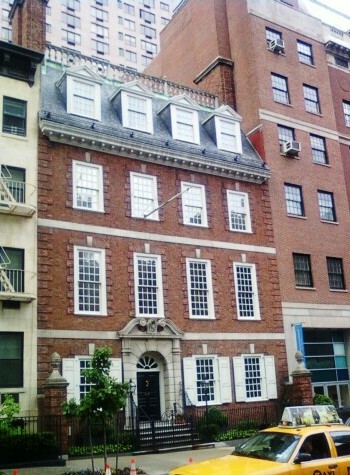 Dana (who was, incidentally, the grandson of Henry Wadsworth Longfellow) had created a near-copy of the 1750 home of John McEvers which had stood at No. 34 Wall Street. The Times noted "The facade is plum color brick, such as was used in the Schuyler mansion in Albany." Dana studied and copied elements from 18th century homes. The balusters and double-spiral newel post of the stairway was a copy of that in the 1740 John Hancock house in Boston. The Palladian window overlooking the rear garden was from Mount Pleasant, the Philadelphia home of Benedict Arnold, and the garden balcony was reproduced from the old Boston State House. Interior elements which were not meticulous reproductions were period relics. 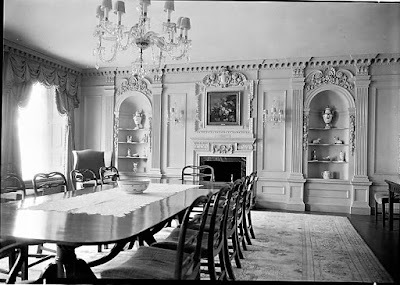 The dining room, for instance, a gift of Mrs. Edward S. Harness, came from a 1760 house in Ipswich, England. The marble mantel in the library dated from the 18th century as well and was brought from England. Dana's personal notes say he drew inspiration for the shell-crowned niches in the pine-paneled drawing room "from the Lady Pepperell house;" however the editors of the 2006 Re-Creating the American Past say "But in actuality it is from Sparhawk Hall (1740) in Kittery, Maine." The pedimented doorway in that room, they say, was "copied from the Miles Brewton house, in Charleston, South Carolina." The New York Times reported "Old Chinese wallpaper and a pine mantel and overmantel are features of the small reception room to the right of the main entrance." 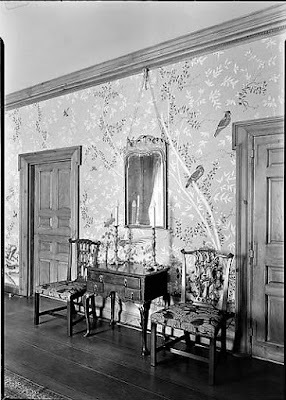 The mid-18th century wallpaper had been carefully removed from a castle in Yorkshire, England. 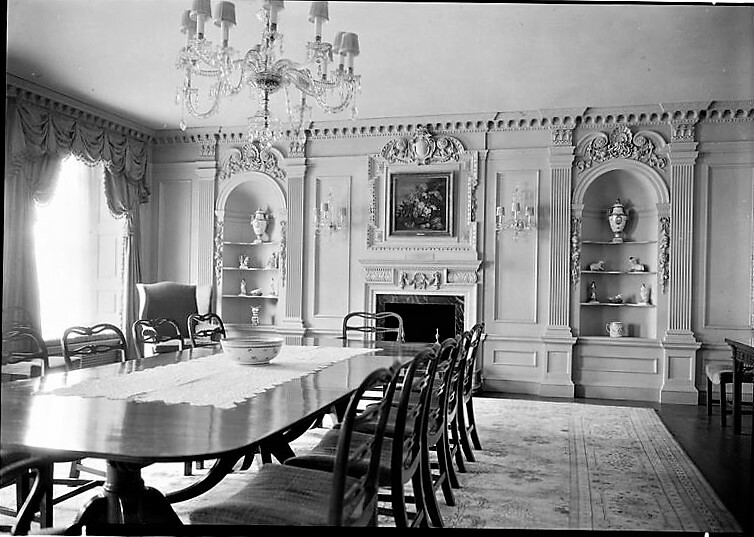 The Society's members donated many of the antique furnishings and decorations. "In the entrance hall hangs the christening robe of William Bradford, brought over in the Mayflower, the gift of John T. Terry and the late Mrs. Terry. The sword of Roger Sherman, a signer of the Declaration of Independence, lent by Mrs. William H. Leonard Edwards, will be shown in the library," reported The Times. On February 23, 1931 the National Society of Colonial Dames staged its first exhibition in the building. Opened only "to members and friends" it was an assemblage of English salt glaze and portraits by John Singleton Copley. 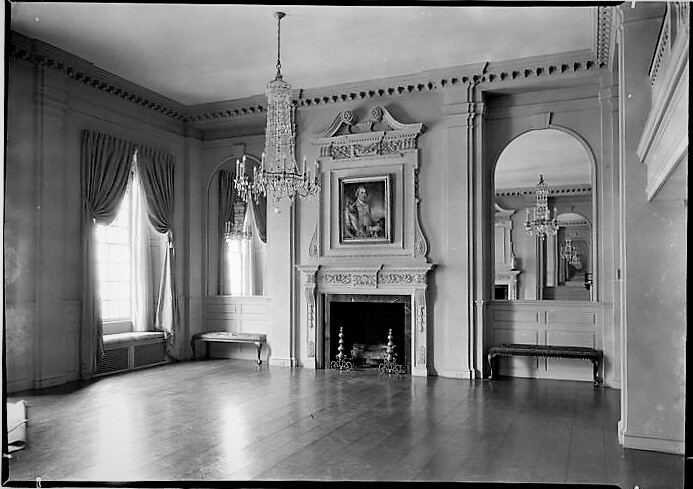 The dignified rooms were available to members for private engagements. Such was the case on December 5 that year when Mrs. Charles Boyd Curtis hosted a "reception with dancing" in the headquarters to introduce her granddaughter, Vivian Boyd Curtis, to society. Vivian was the daughter of Mr. and Mrs. Ronald Eliot Curtis. This would be just the first of several important events for the family held in the Society headquarters. The Society staged "annual autumnal exhibits" here. In 1932, for instance, members loaned about 150 examples of early lighting from their personal collections. The Times wrote "They range from tin lamps for burning whale oil and rush lights which dimly illuminated the crude homes of the Pilgrim Fathers, to ornate glass kerosene lamps which gleamed in the parlors of mid-Victorian days." Included in the exhibit was the tinder box of Pieter Schuyler, first mayor of Albany, dated 1710, loaned by Mrs. Stephen H. P. Pell (it was just one of 25 items she loaned); and four silver-plated candlesticks loaned by Mrs. Eliot Tuckerman. They originally belonged to the first Chief Judge of Maryland, Benjamin Rumsey, in 1779. On January 22 1935 the Society held its first "hobby show." The all-encompassing name provided for a wide-range of items. "The collection of art objects and curios is the principal hobby represented," explained The Times. Mrs. John D. Rockefeller, Jr. provided her collection of Persian miniatures; Mrs. William A. Putnam loaned Whistler etchings; and Josephine Atterbury provided her collection of early American painted snuff-boxes. There were porcelain dogs, "obscure botanical books," and "old-fashioned lace-edged valentines" among the objects collected by members. Unlike other exhibitions, women who attended the one-week show were charged $1 each. The society explained the fee would "be used toward retiring the mortgage on the Colonial Dames House." In December 1932 Vivian Curtis, whose debut reception was held in the clubhouse a year earlier, was married here. And five years later on October 14, 1937, the house was the scene of the marriage of her sister, Madeleine, to James W. Walsh, Jr. The wedding reception was held in the ballroom afterward. Although the doors of the headquarters were closed to all but members, art students were admitted to view the period interiors and furnishings. That changed, though, in 1939 when New York City hosted the World's Fair. The exposition coincided with the 150th anniversary of the adoption of the Constitution. The members opened the building for guided tours. 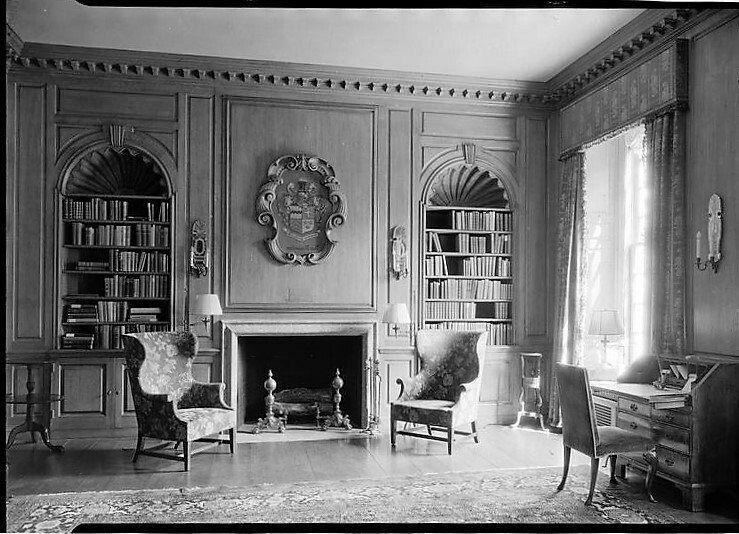 In reporting on the new arrangement, The New York Times mentioned "One of the most interesting rooms is the library over which Mrs. Francis Boardman presides. Its 4,000 volumes on genealogy, thought to be the largest of its kind in the country, are of interest no less to the younger generation of members than to the older women to whom the study must always be an unfinished pursuit." Mrs. Francis Boardman was the former Anne Mary Calef of Boston. There were some who viewed the members of societies like the Colonial Dames or the Daughters of the American Revolution as snobbish matrons seeking self-importance through their family roots. But she explained to the reporter "a history of any family is a social panorama in miniature of the history of the country. The men who recited Greek verse as they plowed had a quality we need to save us today." Today the Society offers tours by appointment. The rear garden, known as the Liddell Memorial Garden, is a hidden treasure. It was renovated in 2008 by landscape architect Laurie Eichengreen. The Society's website notes that here "Architectural elements include large planters and a reproduction of an eighteenth-century English fountain." I guess this is different from the Colonial Dames of America, which had its headquarters at 421 East 61st Street. You can see a photo of the building, next to two enormous gas holders from 1951, on page 472 of "The Columbia Historical Portrait of New York" by John A. Kouwenhoven. I believe they are available by appointment to the general public. Check of their website to confirm that.